BBQ Caterers Leeds are a family run local business proud of our food and the number of awards in recognition. Free range barbecue caterers Leeds perfect barbecue outside catering for any occasion, wedding, party, function or event. We use free range pigs bred near Leeds to produce our quality barbecue sausage range and only 100% outdoor reared beef going into all our handmade burgers and all our own marinades and rubs for our barbecue catering. Discover what great food and really scrumptious bbq catering is all about and available for any occasion in Yorkshire and with lots of menus we are sure to have one that suits your occasion. Our barbecue catering can be served inside to suit different times of the year or your needs, feel free to speak to our team about how we can cook outside and serve a barbecue inside for your occasion or event. Succulent hog roasts Leeds family run professional caterers using locally bred free range pigs. We then slow roast whole hog roasts to produce succulent and flavoursome pulled pork hog roasts. The hogs are winners of the prestigious "Good Pig Award 2012". The pigs are bred for quality and taste that produces marbled lean meat enhancing the flavour and succulence whilst making the finest crackling around, assuring that our hog roast service will be the best hog roast Leeds you will have ever tasted along with a professional reliable service from a well established registered outside catering company. A hog roast can be easily served inside as easily as it is served outside so feel free to ask for yours to be served inside particularly in the colder months of the year. 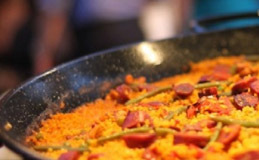 Big Pan Catering is massive on the continent and is becoming more popular in the UK every year. Choose from our authentic Spanish Paellas or you cant beat our traditional Mexican Chilli or even our Moroccan Lamb with all the subtle herbs and spices that makes it one of our most popular dishes but if your looking for something more exciting try our sizzling Mexican chicken fajitas. Your guests get to see the menu made right in-front of them in the giant paella pan, absorbing all the sizzling and smells of the ingredients coming together in one big pan before being served straight from the pan to the plate. These big paella pan menus can be cooked and served inside with good ventilation and so a great for any time of the year or occasion. Our team of Wedding Caterers Leeds encourage our clients to mix our menus and packages around to suit their needs and requirements. We supply a high quality, stylish and professional Leeds wedding catering service throughout Harrogate, York and Yorkshire for weddings and the evening wedding celebration and have done so as established outside caterers for many years. Browse our delicious free range menus and feel free to add in or take out elements of our menus to create one that's perfect and meets you and your needs. Most of our menus and packages can be wholly or partly served to guests tables if required or just served in a relaxed buffet style setting for a more atmospheric and relaxed ambiance depending on your specific requirements. 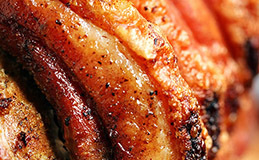 At BBQ Caterers Leeds we are specialist family run hog roast, ethical barbecue catering and pulled pork company based near Leeds that serves the Yorkshire region to include Sheffield, Hull and York using only locally reared free range Yorkshire pigs, lambs and beef for traditional pulled pork hog roasts, oven roasts and barbecues. We provide the very best Leeds BBQ Catering available. 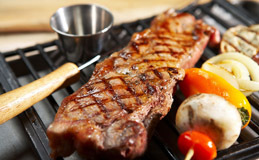 The BBQ Caterers Leeds team all agree that it is important that we use only the best local Leeds BBQ produce for our barbecue catering and hog roasts and that the meat we use has had a good, well cared-for life. A Hog Roast Hire is a fantastic way of producing and serving high quality food for large numbers, without breaking the bank. At hog roast HQ we know how much of a great impact great BBQ catering can make on any event and the hog roast in particular has terrific theatre with a great wow-factor. In its simplest form, the bap or baguette is not much to look at, however by the time we have filled it with our fantastic meats and fillings it is something to behold. Here in Leeds BBQ catering has grown in popularity for weddings, parties and events such as corporate open days – a Leeds BBQ Hog Roast for example is a great draw factor for fund-raisers too! A Barbecue catering hog roast is the perfect outside catering solution for Leeds corporate events, product launches and open days, wedding catering and is also ideal for all sorts of occasions throughout the year. Having one of our Barbecue catering banquets or hog roasts is a great way of celebrating Guy Fawkes or Halloween night and perfect for Christmas parties too. 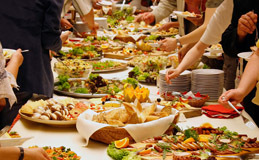 At Happy Hogs Leeds Barbecue Caterers we do a lot of weddings and our wedding caterers and event caterers Leeds are always impressed with how well our hog roasts Leeds and bbq catering is received by all. All the meat our bbq caterers use is free range and roasted to perfection with other elements from our menu range available to be mixed around to meet our clients specific needs for their occasion of event. Call hog roasts Leeds today to book our barbecue catering team for your hog roast party or hog roast wedding. Our Leeds Caterers are pleased to have now won ‘The North of England’s Wedding Awards’ in the caterers category for our Leeds Barbecue Catering service. We went up against Exclusive Caterers Dine from Sarah Beeny’s wedding venue Rise Hall and Michelin star dining from Box Tree Catering previously owned by James Martin celebrity TV chef and many other Yorkshire catering specialists.